Keratoconus treatments have come a long way in recent years with several excellent, clinically proven techniques that can greatly improve quality of life and help avoid corneal transplantation. Keratoconus treatments are recommended based on individual circumstances taking into account the stage of progression, age and patient lifestyle amongst many other factors. Corneal specialists agree that it is best to exhaust all non-surgical options before undergoing corneal transplant surgery. Introductions of new technologies and treatments continue to push forward the boundaries of keratoconus management. 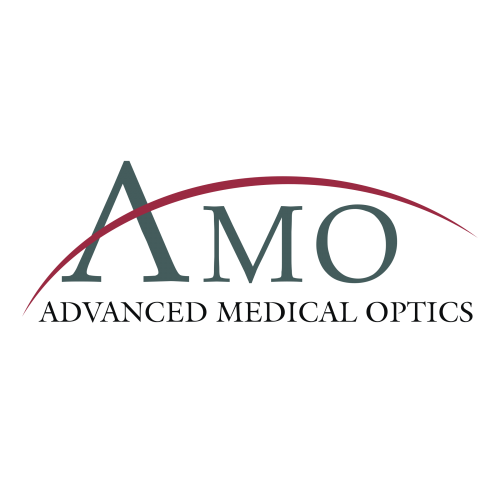 What are the options when glasses no longer provide functional vision? The treatment ladder for keratoconus is complex. Outlined below are a few of the latest, clinically proven methods that help patients. 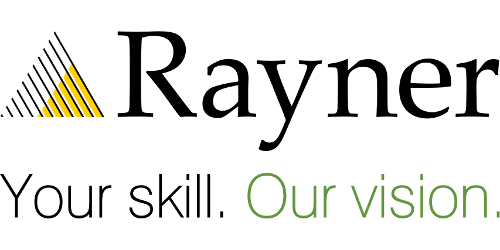 It is not uncommon for treatments to be combined to obtain the very best outcomes. Cross-linking is not a new technique and has long been used as a medical interventional technique. Commonly used to modify the strength of substances (such as fillings in dentistry), cross-linking has been used for a number of years in ophthalmology. It is a non-surgical method utilising an Ultra Violet A light source, which is delivered onto the cornea together with a chemical mix largely made up of riboflavin for strengthening the collagen fibres within the corneal structure. The combination of the UVA light and the riboflavin creates a joining or bonding of the chemical structures within the cornea. (Riboflavin is commonly found in our food and also known as vitamin B2, which is an easily absorbed micronutrient with a key role in maintaining health in both humans and animals). 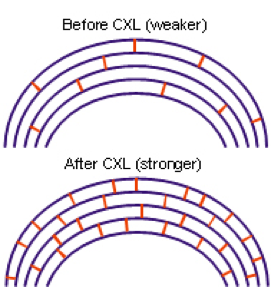 This comparatively simple procedure has been shown in laboratory and clinical studies to increase the amount of collagen cross-linking in the cornea and subsequently strengthen the cornea. There are published European studies, to show that this Cross Linking procedure has been proven safe and effective in patients with no side effects reported. Additionally, retreatment is an option at a later date if required. 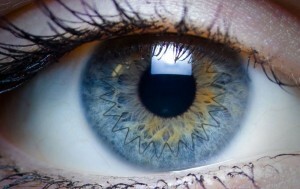 Cross-linking therapy is being used for a number of diseases of the cornea and is proving a useful treatment in conjunction with other surgical techniques such as Intacs and refractive laser surgery. However Cross linking is not for everybody, the first requirement is to ensure that the thickness of the cornea is adequate for the treatment. 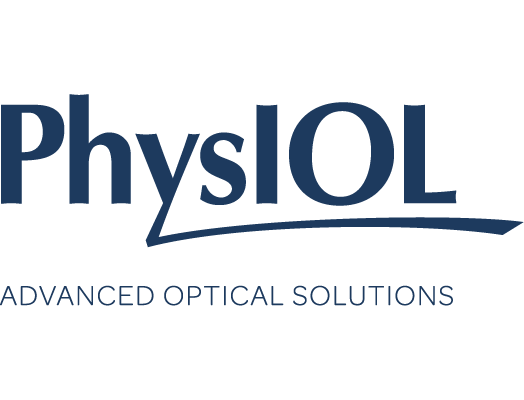 Special non-invasive measuring devices are used by your specialist to accurately and quickly take these readings. The insertion of corneal rings is a surgical procedure. These rings are small, clear, semicircular plastic rings of various thicknesses, which are inserted inside the cornea at its outer edges. Their insertion flattens the central area of the cornea and corrects myopic refractive errors. A major advantage of this procedure is that no tissue is removed and there is no ablation or incision across the visual axis. INTACs and Kerarings have been proven to stop or slow down the progression of keratoconus, although often glasses or contact lenses will be required. 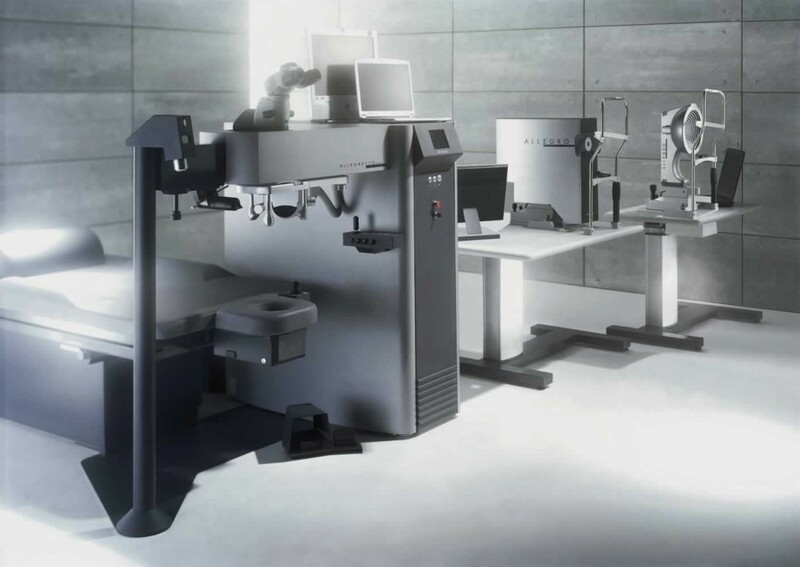 For the very best results, femtosecond laser insertion of rings offers the greatest accuracy and safety. Such treatments must be performed with Corneal Collagen Cross Linking in order to strengthen the cornea. This reduces the risk of a further change in shape in time. T-CAT laser is at the very forefront of keratoconus treatment and is only available in some specialist centres.  The Implantable Contact Lens (ICL) has been available for over 20 years and is custom made for each individual, The lens is a micro-thin implant that is able to correct the often very high prescriptions associated with keratoconus, ranging from +8.00D longsightedness to -20.00D short-sightedness, whilst also correcting up to 6.00D of astigmatism. 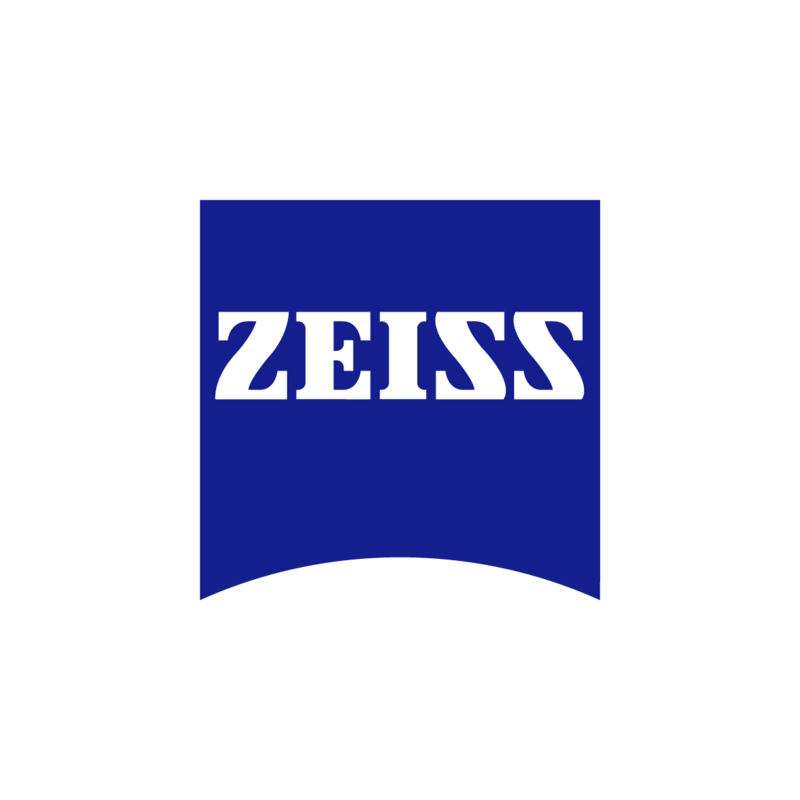 The lens is designed to be inert and 100% compatible with the natural environment of the eye. Other advantages of the material include UV-A and UV-B protection, anti-reflectivity and exceptional optical clarity. When all else fails, corneal transplantation remains an excellent method for improving the vision in advanced cases of keratoconus. However it is only undertaken after ruling out other treatment options. Traditional full thickness grafts are termed ‘Penetrating Keratoplasty’ (PK). Such transplants carry a greater risk of complications such as graft rejection. PK has limited lifespan and for the younger patient, the probability of rejection and failure is therefore greater and a second corneal transplant would be required. The absence of blood vessels in the cornea means that the healing process is slow and it may take a year or even longer before the shape of the transplanted cornea (and effectiveness as a focusing lens) has stabilised. During this time, vision in a transplanted eye would often not be functional. A newer technique is a partial corneal graft, which is termed ‘Deep Anterior Lamellar Keratoplasty’ (DALK). 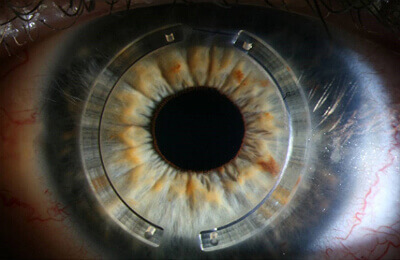 This is the preferred method for corneal transplantation. This technique has been practiced commonly for the last decade. It replaces the main structural layer (known as the stroma) but preserves the innermost layer of the cornea (known as the endothelium). This means that if initially successful, there is a very low chance of failure or rejection later on like PK. There is a risk that even after absolutely perfect surgery, the healing process could be distorted causing the graft to become mis-shaped, creating abnormal astigmatism. The most common method of improving the vision for Keratoconus patients. Supported by natural tears, the surface of the cornea is reshaped for better vision. Corneal segments are small, transparent rings of various thicknesses, which are inserted with the precision of femtosecond lasers within the the cornea. 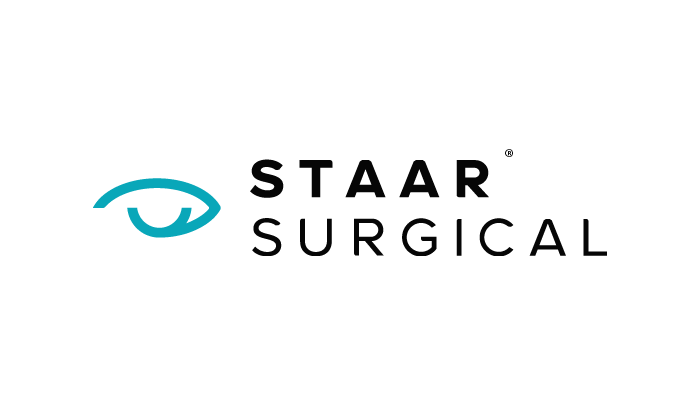 Implantable Contact Lenses are a minimally invasive, reversible surgical option used to reduce dependence on glasses and contact lenses in Keratoconus. Cross-linking is a relatively new surgical technique that takes no more than 20 minutes and is used to prevent progression of keratoconus. 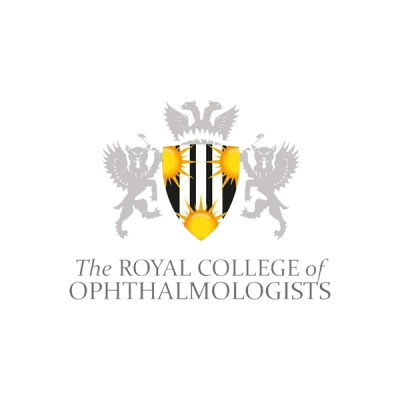 Topography guided laser surgery uses of a bespoke ablation profile to reshape an irregular cornea to a more regular shape, thereby improving quality of vision. Corneal transplants are used when all other treatment options are ineffective in improving vision. 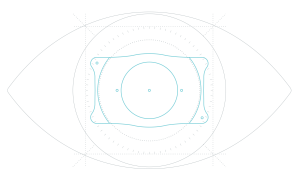 Modern surgery uses femtosecond laser technology for more precise results.